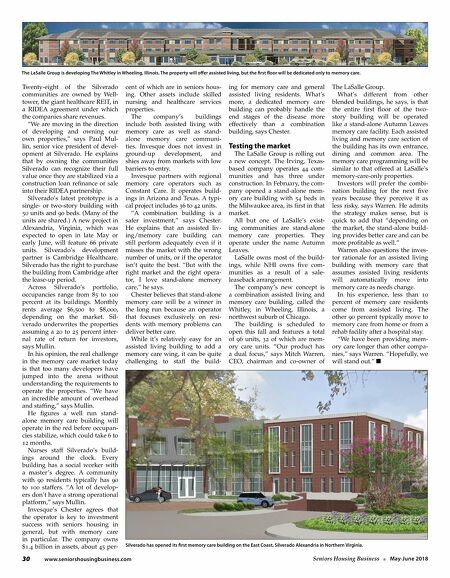 30 www.seniorshousingbusiness.com Seniors Housing Business n May-June 2018 Twenty-eight of the Silverado communities are owned by Well- tower, the giant healthcare REIT, in a RIDEA agreement under which the companies share revenues. "We are moving in the direction of developing and owning our own properties," says Paul Mul- lin, senior vice president of devel- opment at Silverado. He explains that by owning the communities Silverado can recognize their full value once they are stabilized via a construction loan refinance or sale into their RIDEA partnership. Silverado's latest prototype is a single- or two-story building with 50 units and 90 beds. (Many of the units are shared.) A new project in Alexandria, Virginia, which was expected to open in late May or early June, will feature 66 private units. Silverado's development partner is Cambridge Healthcare. Silverado has the right to purchase the building from Cambridge after the lease-up period. Across Silverado's portfolio, occupancies range from 85 to 100 percent at its buildings. Monthly rents average $6,500 to $8,000, depending on the market. Sil- verado underwrites the properties assuming a 20 to 25 percent inter- nal rate of return for investors, says Mullin. In his opinion, the real challenge in the memory care market today is that too many developers have jumped into the arena without understanding the requirements to operate the properties. "We have an incredible amount of overhead and staffing," says Mullin. He figures a well run stand- alone memory care building will operate in the red before occupan- cies stabilize, which could take 6 to 12 months. Nurses staff Silverado's build- ings around the clock. Every building has a social worker with a master's degree. A community with 90 residents typically has 90 to 100 staffers. "A lot of develop- ers don't have a strong operational platform," says Mullin. Invesque's Chester agrees that the operator is key to investment success with seniors housing in general, but with memory care in particular. The company owns $1.4 billion in assets, about 45 per- cent of which are in seniors hous- ing. 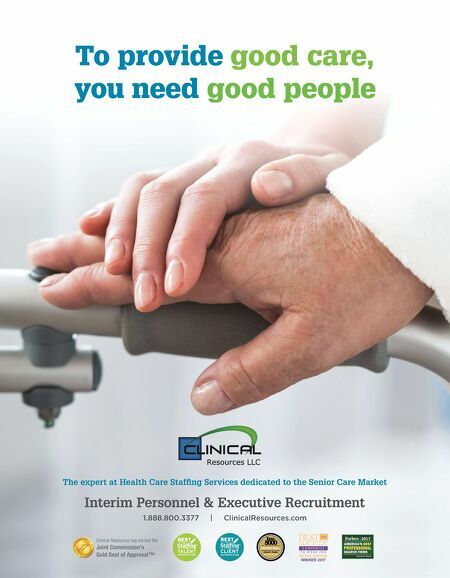 Other assets include skilled nursing and healthcare services properties. The company's buildings include both assisted living with memory care as well as stand- alone memory care communi- ties. Invesque does not invest in ground-up development, and shies away from markets with low barriers to entry. Invesque partners with regional memory care operators such as Constant Care. It operates build- ings in Arizona and Texas. A typi- cal project includes 36 to 42 units. "A combination building is a safer investment," says Chester. He explains that an assisted liv- ing/memory care building can still perform adequately even if it misses the market with the wrong number of units, or if the operator isn't quite the best. "But with the right market and the right opera- tor, I love stand-alone memory care," he says. Chester believes that stand-alone memory care will be a winner in the long run because an operator that focuses exclusively on resi- dents with memory problems can deliver better care. While it's relatively easy for an assisted living building to add a memory care wing, it can be quite challenging to staff the build- ing for memory care and general assisted living residents. What's more, a dedicated memory care building can probably handle the end stages of the disease more effectively than a combination building, says Chester. Testing the market The LaSalle Group is rolling out a new concept. The Irving, Texas- based company operates 44 com- munities and has three under construction. In February, the com- pany opened a stand-alone mem- ory care building with 54 beds in the Milwaukee area, its first in that market. All but one of LaSalle's exist- ing communities are stand-alone memory care properties. They operate under the name Autumn Leaves. LaSalle owns most of the build- ings, while NHI owns five com- munities as a result of a sale- leaseback arrangement. The company's new concept is a combination assisted living and memory care building, called the Whitley, in Wheeling, Illinois, a northwest suburb of Chicago. The building is scheduled to open this fall and features a total of 96 units, 32 of which are mem- ory care units. "Our product has a dual focus," says Mitch Warren, CEO, chairman and co-owner of The LaSalle Group. What's different from other blended buildings, he says, is that the entire first floor of the two- story building will be operated like a stand-alone Autumn Leaves memory care facility. Each assisted living and memory care section of the building has its own entrance, dining and common area. The memory care programming will be similar to that offered at LaSalle's memory-care-only properties. Investors will prefer the combi- nation building for the next five years because they perceive it as less risky, says Warren. He admits the strategy makes sense, but is quick to add that "depending on the market, the stand-alone build- ing provides better care and can be more profitable as well." Warren also questions the inves- tor rationale for an assisted living building with memory care that assumes assisted living residents will automatically move into memory care as needs change. In his experience, less than 10 percent of memory care residents come from assisted living. The other 90 percent typically move to memory care from home or from a rehab facility after a hospital stay. "We have been providing mem- ory care longer than other compa- nies," says Warren. "Hopefully, we will stand out." n The LaSalle Group is developing The Whitley in Wheeling, Illinois. The property will offer assisted living, but the first floor will be dedicated only to memory care. Silverado has opened its first memory care building on the East Coast, Silverado Alexandria in Northern Virginia.